This Japanese award winner fashions a captivating coming-of-age tale from the country's traumatic past. As World War II rages, teenager Suzu Urano agrees to wed naval clerk Shūsaku Hōjō. Moving to live with his family on the other side of Hiroshima, she pursues a new future; however, history dictates that a spate of bombings and a hovering mushroom cloud will change her life forever. Learning both patience and subtlety from his time as an assistant director on Kiki's Delivery Service, writer/director Sunao Katabuchi crafts a moving drama that's as resonant in emotion as it is rich in animated detail. Filled with watercolour splendour yet potently conveying the many difficulties of even ordinary tasks during wartime, In This Corner of the World proves a stellar addition to Japan's cinematic contemplations of conflict, hand-drawn or otherwise. It’s with a leisurely air that In This Corner of the World unravels its coming-of-age tale, yet the relaxed pace, sweet sentiments and gorgeous visuals expected of Japanese animated fare prove somewhat deceptive. The latest feature from Mai Mai Miracle writer/director Sunao Katabuchi is an enchanting delight, but in a thoughtful, measured and even mournful way. Indeed, the crowd-funded film’s many charms spring as much from its tone of sorrow as from its lingering hope, ensuring the quiet, patient feature has a sizeable impact. It is exactly what a tender yet tragic Second World War-set effort should be, especially one that sweepingly traces a young woman’s determined journey to adulthood as uncertainty and worse looms over Japan. As Katabuchi lovingly helms the second screen adaptation of Fumiyo Kono’s manga Kono Sekai no Katasumi ni (following an earlier live-action television special), his Studio Ghibli pedigree - as an assistant director on Kiki’s Delivery Service - is evident. And, that he shares the iconic animation house’s ability to evoke a sense of wonder while exploring complex emotions should endear his film to international audiences following its Tokyo International Film Festival premiere and subsequent November theatrical release on home turf. Like the thundering Japanese behemoth with similar historical parallels currently raging its way through global cinemas, Shin Godzilla, In This Corner of the World steeps its meticulously researched story not just in physical devastation, but in the resilience it takes to endure and overcome tough, times. With protagonist Suzu Urano (voiced by Non, the stage name of model and actress Rena Nônen) first spied as a child, filling in for her ill older brother on the family’s seaweed delivery route, the film’s hardy, can-do attitude is evident from the outset. Time passes, and soon 1933 becomes 1943, with text on screen marking the changing months and years. Now 19 years old, aspiring artist Suzu harbours a secret crush on seemingly disinterested neighbourhood bully Tetsu (Daisuke Ono); and yet, when a marriage proposal comes her way, it’s actually from a stranger. Agreeing to wed naval clerk Shūsaku Hōjō (Yoshimasa Hosoya) means relocating to Kure on the other side of Hiroshima, living with his family, and starting life anew. Her days are filled with intensive housework, stolen moments as a bond slowly forms with her kindly husband, curt words from his sister (Minori Omi), and the many changes the war brings — and then the bombings start. Shaking imagery and cuts to black offer the possibility that Suzu’s interrupted existence might be a dream, using flourishes from her own sketches and paintings as a brief visual respite from the narrative hardship, as the story plunges into the darker side of events from 1944 onwards, and the accompanying struggle against adversity. 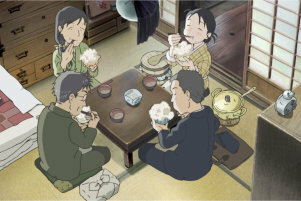 Accordingly, In This Corner of the World becomes a delicate balancing act in a raft of ways, though it is the film’s many clashes — of duty, fantasy and destruction; of peaceful days interrupted by terror from above; and of optimism and acceptance, just to name a few — that ultimately proves so involving and entrancing. In fact, those contrasts are so finely ingrained in the narrative, as are the film’s themes of fortitude and perseverance, that the animated splendor always feels as though it’s cloaked in shadow. This is a beautiful, heart-swelling animated movie, to be certain, but it’s also one that knows that such picturesque sights and pleasant sensations are only part of the equation. Such an astutely moving sentiment infuses every intricately drawn frame and though Katabuchi isn’t always subtle in making it plain, he is sensitive in his approach. So too, the feature’s discerning voice work, particularly Non’s efforts to render unlikely yet resolutely cheerful heroine Suzu with as much realism as possible. - Sarah Ward, Screen Daily, 28 October 2016.